I have so many things I want to talk to you about from week to week, but I also wonder what you might actually want to hear. I've been writing this blog now for over a year, and doing it weekly for about eight months. When I first started writing it I planned to put tips and hints, fun things like notices about upcoming writing competitions I've heard about and other stuff. But I'm starting to wonder if this is helpful for you or if you'd prefer more variety. So ... I've made a decision. I'm going to shake it up a bit. Oh, don't worry, everything I post will still be related to writing, but I thought instead of just rattling off ideas about writing, and my own theories on things, I thought I might post some of my unpublished work. Not every week, of course - I thought maybe once a month or so. I don't want to bore you silly. But it's one thing for me to bang on about what you should and shouldn't do - which after all, is just my opinion - but perhaps I should give you something interesting to read. Please contact me and tell me what you think. I know that to comment on this site you're supposed to sign up, but if you want to contact me you can do so via my website. My stats show that there are lots of you reading this blog, all around the world! I'm often amazed when I see I have readers in Germany, Russia, Korea, as well as England, the US and Australia! I feel very humble. I'd love to hear from you if you have comments or suggestions. If you have writing questions, a topic you'd like me to discuss or if you would like to share your own writing experiences with me, please email or post a comment on this site. This week I want to tell you people in the U.S what lucky ducks you are! I subscribe to Writer's Digest which is a fantastic website containing all things related to writing. Every day they email me info about different courses and workshops they have and more often than not there's something I'd love to attend. Unfortunately, for those of us in Australia, it's not as easy to attend these courses but I wish I could. Perhaps one day I'll treat myself and attend a conference. I know there's a great one coming up in New York in August - the Writer's Digest Annual Conference. Well, I can dream! In any case, the Writer's Digest website has a tutorials section which my subscription gives me access to and I can listen to recordings of workshops and key note speakers with real information to impart. I have found this site invaluable and highly recommend it to budding - and experienced - writers all around the world and of every genre. For those of us in Australia, there are any number of courses and programs. I haven't found one as comprehensive as Writer's Digest, but we do have the Australian Writers' Centre. This is definitely worth checking out. Well, that's all from me this week. I'll post a short story for you next week and see what you think. Meanwhile, I really urge you to contact me if there's anything you'd like me to include on this page. 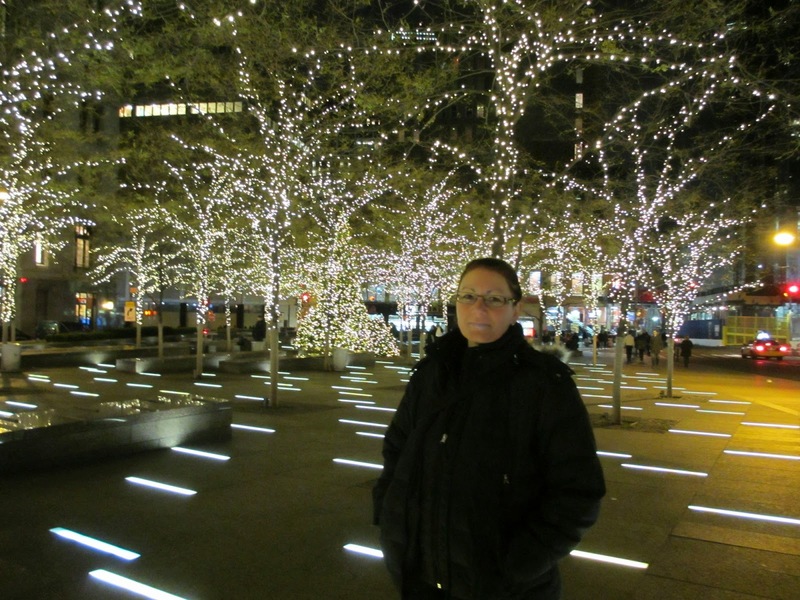 This is me in New York in December 2012. New Yorkers will no doubt recognise this beautiful spot.